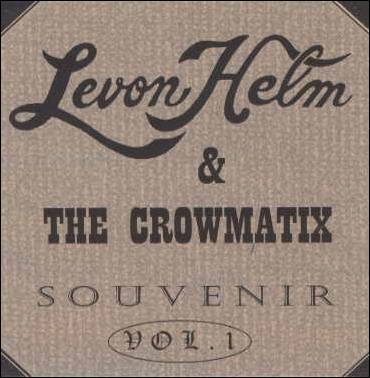 The Woodstock-based group The Crowmatix did several concerts in '96 and '97 together with Levon Helm, and also recorded both on their own and with Levon during this period. Their first CD, released on Aaron Hurwitz' Woodstock Records, is titled Souvenir because Levon refers to it as a "souvenir record", i.e. not a major label release. The CD is now sold out and is no longer available from Woodstock Records. The music is still available for download from iTunes. The Crowmatix are Marie Spinosa, Randy Ciarlante (also drummer and singer with The Band), Aaron Hurwitz, Mike Dunn, and Jim Eppard. The Band members Garth Hudson, Jim Weider, and Richard Bell are also present on Souvenir. Recorded live with Levon Helm on lead vocal, horns by Tom Malone. 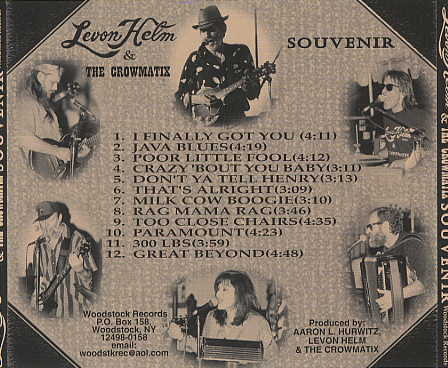 Vocal and accoustic guitar by Levon, back-up vocals by Amy Helm and Marie Spinosa, Garth on accordion. Studio recording. Marie Spinosa lead vocal, Jim Weider on slide guitar. Studio recording. Lead vocal by Randy Ciarlante. Live recording. Levon on lead vocal and mandolin. Live. That's Alright Marie Spinosa vocal, Garth Hudson horns, Richard Bell organ. Studio recording. Levon on vocal. Live recording. Levon on vocal and mandolin. Live recording. Marie & Aaron on vocal. Studio recording. Randy on vocal. Studio recording. Jimmy E. on vocal, Levon on harp. Studio recording. Aaron & Marie on vocal. Studio Recording.